Nothing says springtime like a refreshing glass of rosé. At a recent food and wine tasting at Cooking with Class, guests were spellbound by Elizabeth Rose 2009 Rosé. All eyes were riveted by the colorful elixir that gushed glassfuls of dark pink and magenta hues. And boy, did it deliver on the palate too, with taste buds shifting into high gear as the first sips went down. Newcomers to this wine might mistake the gorgeous color and bold strawberry aromas as a sign of sweetness. Instead, this lip-smacking lovely finishes dry and crisp. Napa winemaker Kristi Koford uses grapes sourced from two certified organic vineyards in Yountville and Oakville to craft the Syrah-based Rhône-style blend. The cold soak and stainless steel fermentation yields a juicy sipper that bursts with fresh-tasting, ripe raspberry and strawberry fruit. Rosy to the end, it blossoms with warm spice and rhubarb tang on the finish. 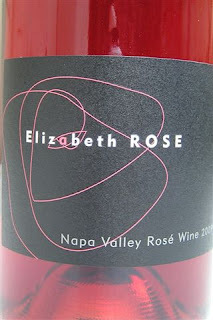 And yes, there really is an Elizabeth Rose. The fetching label of this family-owned winery holds a story of tradition and pluck. A few years ago, this special rosé was created and named for the daughter of one of the winery founders to mark her 21st birthday. As told to us, that red-headed young lady hails from a long line of flame-haired beauties, one being her beloved great-grandmother after whom she was named. The youngster loved all things red and rosy. Flush with youthful imagination, she would often sign her name Elizabeth Rose. Her bemused dad later interpreted this as Elizabeth Rosé. So, with a birthday that marked the end of a childhood era as fanciful Elizabeth Rose and an official passage into adulthood, the wine was given the name Elizabeth Rose Rosé in honor of both youthful exuberance and strong family bonds. Do like they do at Bonded Winery 9 and pair this wine with barbecue and a host of warm weather fare such as lightly spiced salads, white meats, fish and appetizers. Or, take a tip from Elizabeth Rose and drink it all year round, especially with seasonal watermelon salad for total refreshment. Claim your screw-capped bottle for about $12 at Cooking with Class in La Quinta, behind the big Walgreen's off 48th Avenue and Washington Street. Chances are good Chef Andie and I will share this springtime goodness at another Cooking with Class event but why wait? Check out the April class schedule now posted online. A week from today on Friday, April 1st is next month's food and wine tasting. Sign up today or call 760.777.1161 to stake your place before this popular event sells out again.